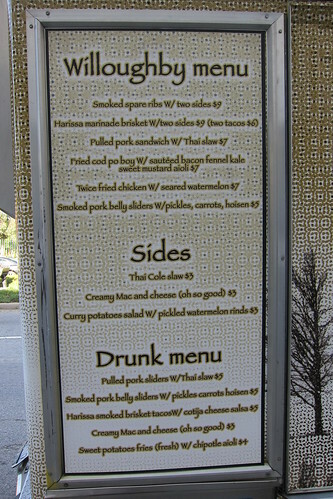 Proving that everyone in Los Angeles -- even food trucks -- can have a second act, Willoughby Road (Twitter: @willoughbyroad) is back on the road. The first time Jeshua Garza and Adrian Ochoa launched their nouveau southern food truck in Jan. 2010, they went out of business in under three months. 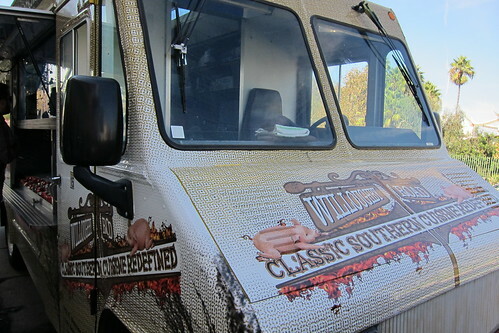 Willoughby Road 2.0 rolled out October 6th, with a retooled business model, menu and truck. "When you first start out, you think this is going to be easy. You think: We have great food. People are going to love it. You think you're going to have a line like the Grilled Cheese Truck or Kogi in two weeks," Garza says. "It's not like people think. It's really difficult. We just couldn't keep up with the rent." What are they doing differently this time? 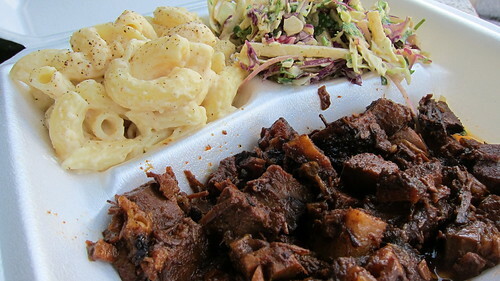 They scaled down their expansive menu to focus on the crowd-pleasers like harissa brisket, Thai coleslaw, mac 'n cheese, cod po'boy and smoked spareribs (though these now have a curry rub instead of an Asian rub). Instead of eight sides, they now serve three. They did a couple dishes, including pork belly sliders and fried chicken with seared watermelon. The chicken is brined for two days in salt, brown sugar, chiles, bay leaves, spices and wood chips. Then it's soaked for another 2-3 days in a mixture of buttermilk, sambal, sesame oil, garlic powder and wood chips. It's breaded and fried three-quarters of the way through. When customers order it, it's coated in a light tempura batter and flash-fried. On the side is watermelon season with salt and pepper and seared so that it's both hot and cold. Garza and Ochoa also reconsiderd their business model. They joined the Southern California Mobile Food Vendors Assocation and moved from Road Stoves to the SCMFVA's recently opened commissary and truck lot on Slauson and 59th. The SCMFVA has also helped them land gigs, according to Garza. Garza says they weren't aggressive or thorough enough the first time around with Twittering and promoting themselves through Facebook. This time, they hired Brittany Clifton, a waitress Garza met while working at The Gorbals in the interim, to handle their social media and promotional duties. "Ilan told me, and this is true for a restaurant or a food truck, when you open this business you think 'My food is going to speak for itself, but it doesn't.' It does, eventually. Word gets around. But you have to stay on top of doing the simplest things on Twitter and keep up with Facebook and your blog. My main focus is my food," Garza says. They're also trying different routes. They're still parking regularly on the controversial and hotly contested stretch of Wilshire Blvd. in Miracle Mile. "It's always such a for sure thing for us. It ends up being a really great lunch," Garza says. They're also branching out to Venice, FIDM in downtown L.A., the Verdugo in Glassell Park, the Hulu headquarters and Eagle Rock Brewery. Soon, they hope to head south. "We are in the process and really want to get our Orange County permits," Garza says. Not to be underestimated, they got a new wrap for their truck. Their first truck was dark with a design that looked like a vintage, wood-panel truck. Garza believes the dark background was a problem. 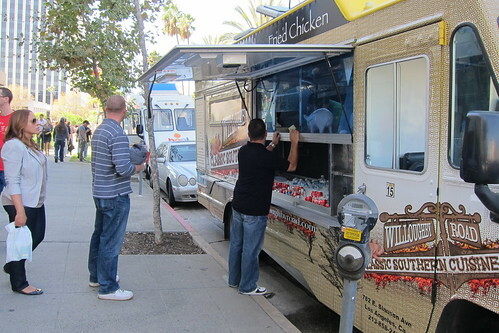 "When you see Nom Nom or The Grilled Cheese Truck or Dogtown Dogs, those trucks stand out. Their colors really stand out. We needed brighter colors. Having something dark, we weren't visible. You couldn't see us from 20 or 30 feet away."